Ideas that incorporate crochet roll stitch in fun ways! The bullion stitch is a unique stitch in crochet that is highly textured and excellent for decorative details across many different types of projects. Unfortunately, it's a stitch that has been underutilized because many people find it awkward to get used to it. Once you've practiced the bullion stitch, you'll find that it's not that difficult after all, and your work will benefit from incorporating it. These 20 free crochet patterns offer many examples of the variety of ways this stitch (also called roll stitch) can be used. My Auntie's Yarn created this free crochet pattern with a "baby bullion" that uses only five yarn-overs, which many beginners might find to be easier than a lot of other bullion stitch crochet patterns. The bullion is used to create a textured flower inside of a square. This square can be used in combination with other squares to create placemats, afghans and other motif-based projects. This is another take on the same idea - bullion stitch has been used to create a floral detail in the center of a textured square. This uses a more traditional bullion with 7 yarn-overs and also incorporates other textured stitches like front post stitches for a more advanced crochet pattern. This is another simple crochet flower with a big impact thanks to the effect of the bullion stitch. This easy flower comes with written instructions, a video tutorial and a tip for using a latch hook to make it easier to work the bullion stitch. This is another variation of bullion stitches worked in the round to create a floral motif. In this case, they are ten yarn-over bullion stitches that are made close together and turned into a medallion for a necklace. Here we see the same concept o the bullion stitch used to create the textured center of a design but instead of a flower it's a beautiful snowflake. In fact, this free pattern comes in three variations so it's actually three crochet snowflakes! Each of these variations uses a version of the bullion stitch that has 12 yarn-overs so it is very dense and three-dimensional. What an adorable way to use the bullion stitch: as a textured detail on the shell of a snail shape! This cute design is placed inside of a square which can then be framed and hung as wall art or used in other crochet projects. There are two bullion stitches used in this project, both mini-versions, using three and four yarn-overs respectively. This is a written crochet pattern with a video tutorial. The crochet bullion stitch is such a detailed stitch that it can be a bold design detail even used as a single stitch in the pattern. We see that here where the seven yarn-over bullion is the body of a butterfly. This is a free crochet pattern with step-by-step photos. Here is a different take on the bullion-body crochet butterfly. This one is worked across two rows, with two bullion stitches stacked on top of each other forming the full body around which the wings are worked. This is all part of a larger design for a crochet square. This pattern is available free through Ravelry. This is a simple three-round crochet heart pattern that begins with bullion stitches worked into a magic circle. These are easy "baby bullions" with five yarn-overs each. These simple crochet hearts make great appliqués, gift tags and bunting. This is a written crochet pattern that also comes with a symbol chart. Here is a version of a bullion stitch heart that is much more complex! 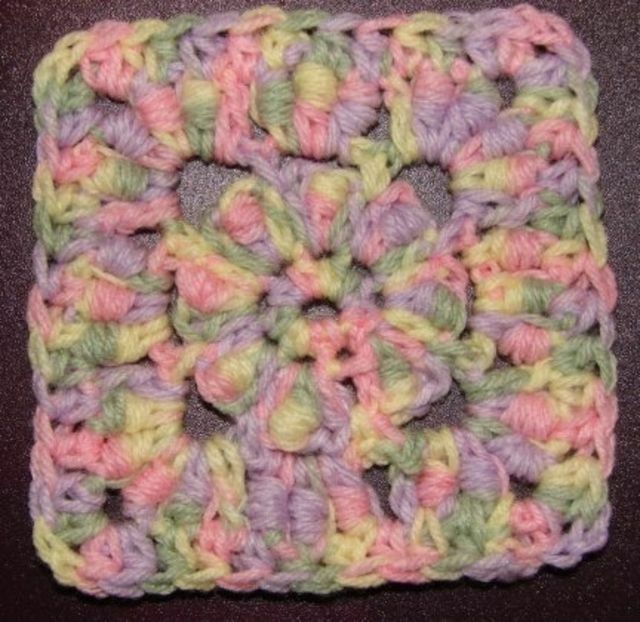 This crochet pattern is designed to be worked in thread and if worked as intended will be about 3" square. Of course, you could also work it in yarn with a larger crochet hook to create a bigger Valentine's gift or even a wreath-replacement for your door! The bullions on this crochet pattern use 15 yarn-overs; it is considered an advanced pattern. This pattern is available free on Ravelry. This is a really simple crochet tutorial for incorporating bullion stitches with clay beads for a bohemian inspired necklace. The necklace itself is a very simple double-stranded single crochet chain. The beads are made from polymer clay (although of course you could replace those with store-bought beads if you don't want to make your own). The bullion stitch adds additional dimension. A row of crochet bullion stitches can be a great edging, a detail we see taken to the maximum here where the stitches form an entire picture frame. This free crochet tutorial comes with the designer's tips for using knitting needles to help make it easier to create the bullion stitches. This pattern is a free download available through Ravelry. Tamara of Moogly has created a unique variation on the bullion stitch that splits it across two stitches to offer the same great texture without the difficulty that some people find the stitch poses. This stitch is showcased in the beautiful slouch hat pattern, a cozy one-skein design. She also uses the stitch in a second design: a one-skein textured cowl pattern. Tamara offers a video tutorial that shows how she works the stitch. One really smart way to use the bullion stitch is in a single row that becomes a very decorative statement row in a piece made with basic crochet stitches. The row can be repeated in larger projects; either way, it's the roll stitches that stand out. We see this in the tote bag pattern here where rows of 6 yarn-over bullion stitches are complemented by single and half double crochet stitches. Crochet designer Rhelena offers a second bullion stitch bag pattern with an entirely different look that is also fabulous. This hot pad is another excellent example of how the bullion stitch stands out as a design detail when separated by basic crochet stitches. In this case, the roll stitches are worked in the round, and they are separated by single crochet and double crochet stitches. This pattern uses two different roll stitches: one with 6 yarn-overs and another with 10 yarn-overs. The bullion stitch is used here as the first and last row of the crochet pattern, creating the long edges of a narrow scarf. It is a terrific design detail. This pattern is available free on Ravelry. Look at the beauty of these fingerless gloves that are so cozy and textured thanks to all of those bullion stitches right on the hands! The way that they are worked is really unique, staggered against each other without a bunch of other types of stitches in between. What a terrific style statement! Olivia of Hopeful Honey offers a free video tutorial to the bullion stitch as part of this crochet pattern. Textured stitches like the bullion stitch are terrific for phone cozies and other gadget cozies because they help to keep electronics safe from damage. MoiraCrochets has created a series of these phone cozies that incorporate a "baby bullion" stitch pattern. She explains that these are 3 yarn-over bullions that "are incomplete bullion stitches because their height is not secured with an elongated chain" but instead are secured by a single crochet stitch following them. This is another variation on the roll stitch that can be good to learn. ADHD offers a free tutorial through Ravelry that shows how she made crochet bullion rings that she then stitched together in rows to create a purse. She explains that you can either make a basic crochet purse and add them on after or use the bullion rings to upcycle an existing purse. Note that the link to the bullion ring tutorial in her PDF is outdated but you can access it through the Wayback Machine. Recreate a Victorian-era bag for a costume or just because it is beautiful using this free crochet pattern. It uses several different versions of the bullion stitch ranging from 10 yarn-overs all the way up to a whopping 16 yarn-overs. It is worked in cotton thread and should be considered an advanced pattern that requires some patience to execute.